Main feature photo: View toward Harbour Bridge from Wendy’s “Secret Garden”. 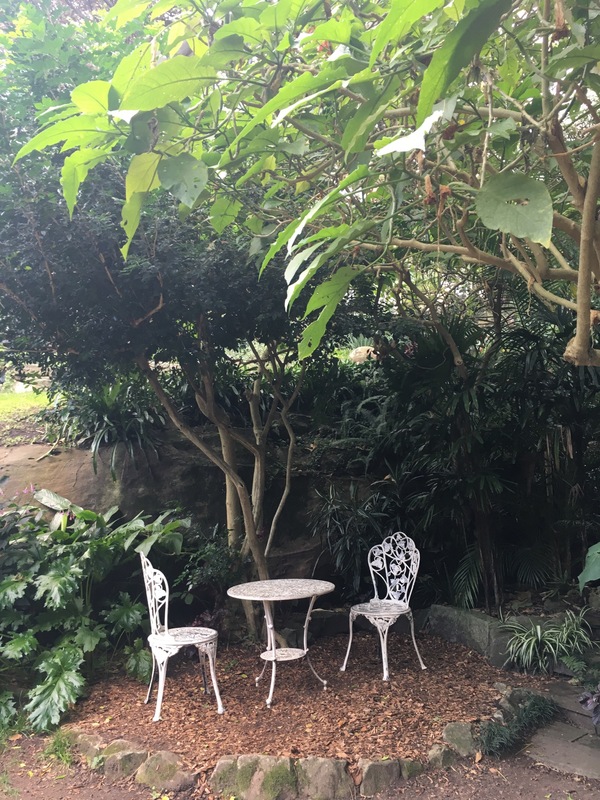 As you walk through the garden there are shady and sunny spots with plenty of seating in each “room” – pathways and stairs lead you from one beautiful space to another. 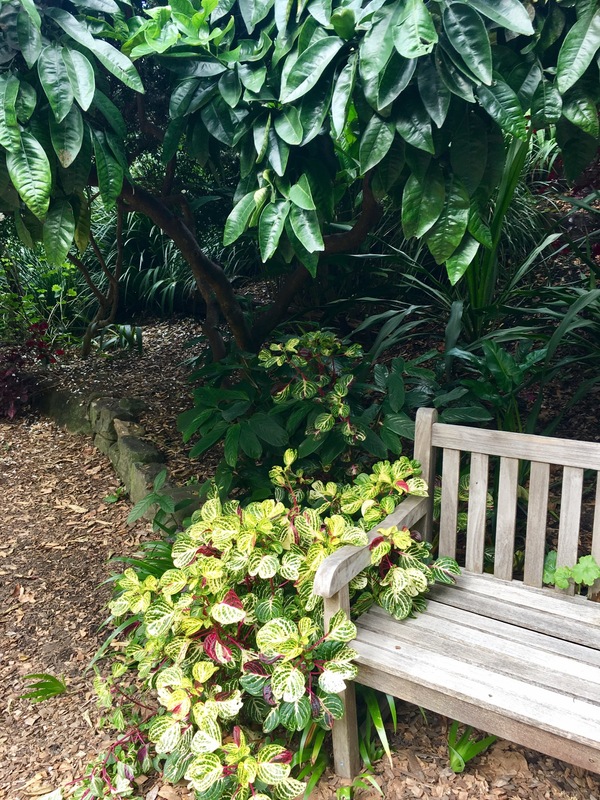 In the photo below on left, I loved the simplicity of the green foliage with a sprinkling of red against the simple wooden seat. The splash of red in the background of the next photo, shows how colour + the stairs help to give the garden depth and mystery as it leads the eye to a different space. I also love the solid form of the bird bath & branches contrasting against the softness of the palms and ferns. 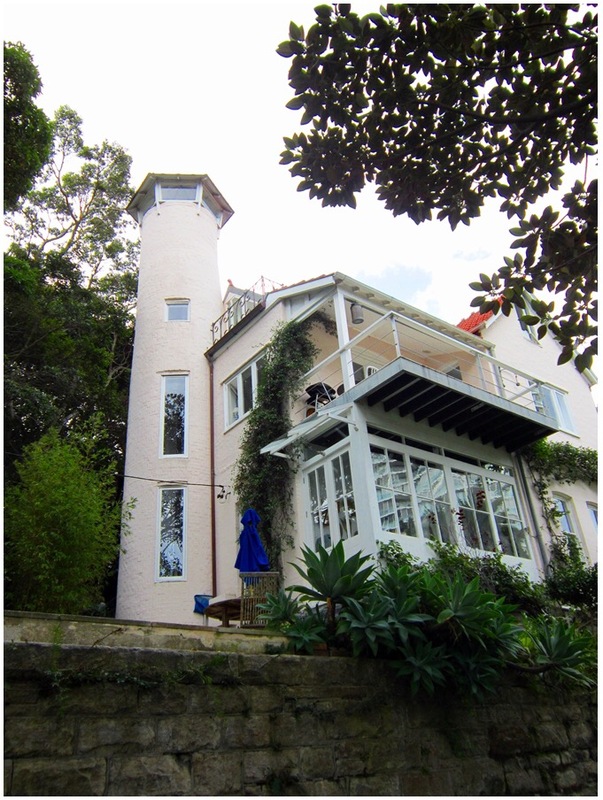 Photo below: Wendy Whiteley’s house…or maybe 1 of her houses as I gather she’s away a lot and then has others caring for the house/garden. Photo in last post of the staff who help her. There’s also an Australian Story (ABC TV) about Wendy’s garden that’s on ABC iView if you’re in Australia. I plan on watching it again soon too – it was filmed a few years ago. Her late husband, Brett Whiteley, was (still is) a famous Australian Artist. 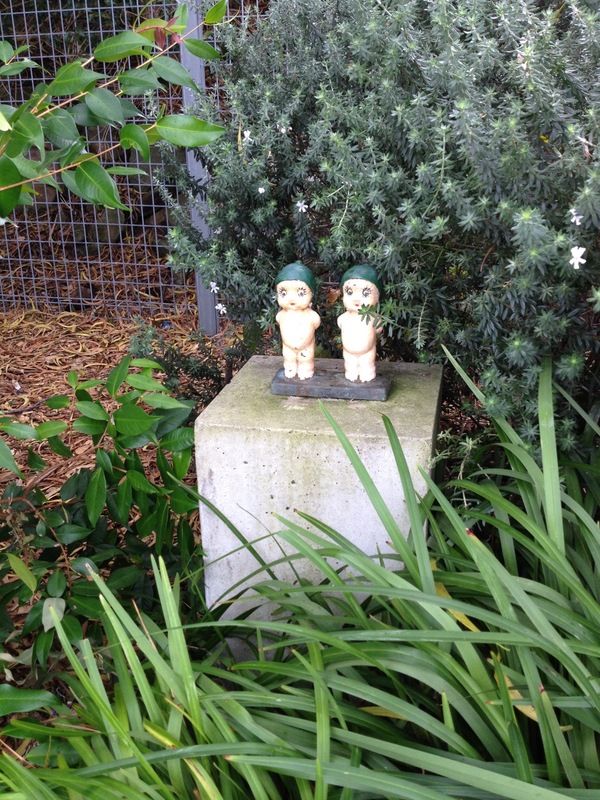 Photo above: Gum nut baby walk…photo from “weekend notes” blog (a great Sydney/Canberra resource). I plan on returning here with my grandchildren while they would still enjoy searching for these whimsical creatures inspired by the writings of the famous Australian Children’s author, May Gibbs; titles such as Snugglepot and Cuddlepie. After an hour or so in Wendy’s garden we walked to a nearby gallery exhibiting works by various Sydney Artists. Near the railway station there’s a statue of a dog (a Foxie)…stop to read the story especially if you’re a dog lover like our family. We then walked back to Kirribilli for a light lunch…we wandered around for 10 min looking at various cafes/menus and decided that where we had morning coffee appealed to us most – Billi Raw – they make delicious wraps, rolls, salads etc. It’s only a small cafe so we were lucky to find a seat as it was very busy with nearby office workers. There’s also a very popular Italian restaurant almost next door to Billi Raw for those wanting a larger lunch. We were having dinner out with family in Surry Hills that night so only wanted something light for lunch. After lunch we strolled around Kirribilli and Milson’s Pt area – taking a look at where Tony lived with his parents in 1973/1974 wish that townhouse was still in the family!! There’s lots to see and do around this area including the North Sydney pool right on the harbour (I’ll search for a photo to put here later) as well as Luna Park (Fun Fair/Amusement park) of course (a photo coming as well). From this point you can do the longer Harbour Bridge walk (see photo of sign below) and in the near future I’ll write about our last short stay in Sydney when we explored the Rocks area – lots of history there about the first European settlement in 1800s to the present. The Rocks is a popular tourist destination as well as some residential areas – not many – as in many big cities, where low/middle income earners have been gradually squeezed out over the years; see photo below of Nth Sydney info board on the subject although the residents of the Rocks, & other villages of Sydney, have created protests groups which have existed up to the present day. 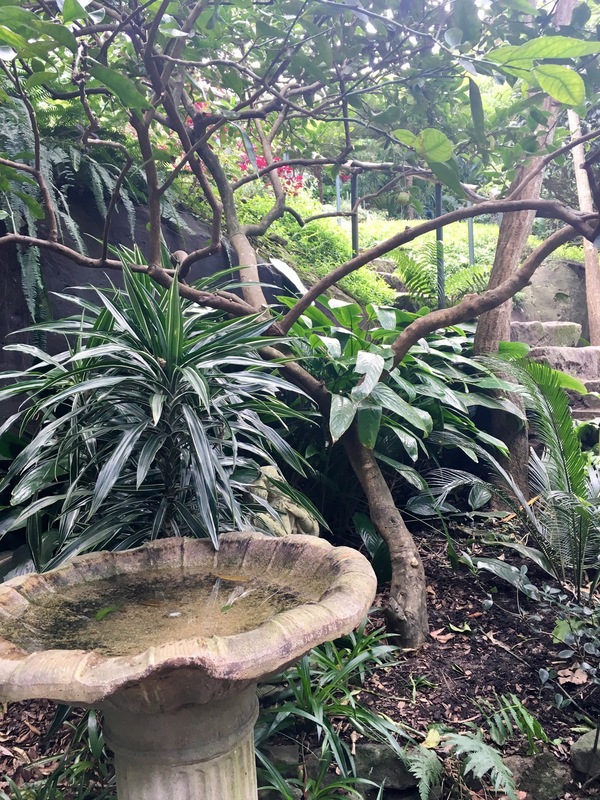 On one of our recent short stays in Sydney we visited a museum near Circular Quay which detailed many of the struggles of community conservation and protest groups – a post for another day! For more information on Sydney’s history as well as self guided walks, go to Sydney.com.au + there’s also a Tourist Information Centre at The Rocks. The Rocks can also be accessed from Circular Quay (Ferry wharf/Train Station). 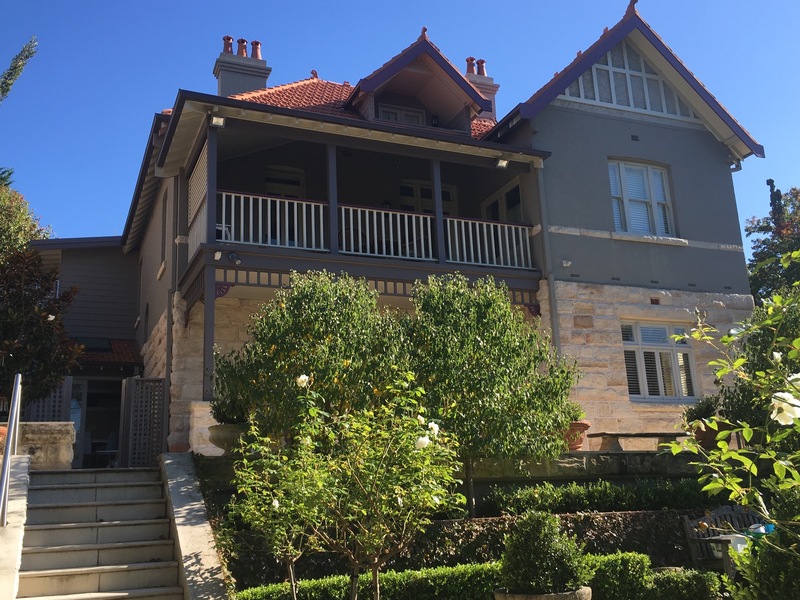 After our stroll around we then walked to Milson’s Point Station (2 min walk from village/street shopping area of Kirribilli) and took the train back to Wollstonecraft Station (about 5 min on the train)…it was then just a 5-10 min to where we were staying at a beautiful Air BnB (photo below). We strolled along slowly as the scenery along the way is so picturesque – a pedestrian bridge links Wollstonecraft with the suburb of Greenwich (photo below). Surrounding the bridge is a leafy gully with a stream and little waterfalls below. We also used this bridge (& the trains) when we went out for dinner at night – it felt very safe with people coming & going + reasonable lighting although we did take small torches as well. Photo below: Air BnB in Greenwich – so lovely…I’ll give it 5 stars on review site. We hope to get back! The owners have 2 self-contained units quite separate from the main residence so everyone has plenty of privacy – with your own entrance, ensuite bathroom, kitchen & living room space. One has a larger bedroom and the other a larger living space. It’s particularly convenient if using the trains &/or buses. We find that way of getting around inner Sydney a lot more relaxing, as parking can be tricky in many places and traffic congested, especially when driving from one side of Sydney to the other, particularly during rush hour (most Australians call it peak hour). However, if you’re travelling to Canberra (a small city) the driving is quite easy and once in the outer suburbs of Sydney it’s a highway all the way. Canberra use to be criticised for “all those round-abouts” but we’ve noticed that many big and small cities across the world now have them – even parts of Sydney. If travelling by car to Canberra it’s about 3 hours once on the Hume highway and about 4 hours on the train from Sydney’s Central Station. Central Railway Station Sydney – Train Trip back to Canberra…approx 4 hours. The scenery along the way is very interesting including outer Sydney, Bowral (a popular Southern Highlands destination), and then farmland onto Bungendore (a picturesque country town with famous wood craft traditions + cafes & restaurants); Bungendore is also accessible by car from Canberra (approx 20-30 min) along the road to the South Coast. 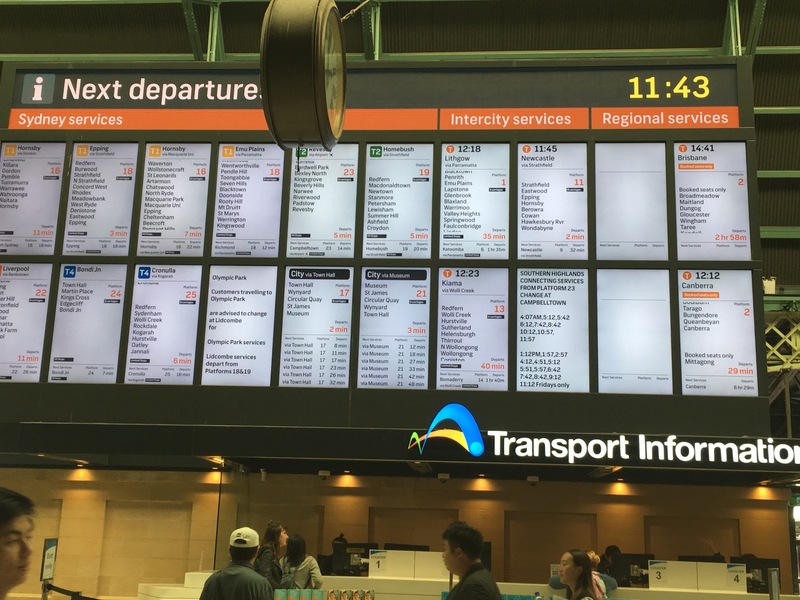 I’ll write about the South Coast in a separate post – in brief…accessible by train from Sydney (see Kiama info below right) although I think the train line only goes as far as Nowra (slightly inland + a lot of industry) and the more appealing destinations are Sth of Nowra. Consequently, car travel south of Nowra is recommended – a stunning coastline right down to the NSW/Victorian Border…some places we love are Mollymook Beach, Milton (on the hinterland), Rosedale, Narooma (Oyster Festival! ), Eden on Far NSW Sth Coast & many other places. A post for another day! Bondi Junction...a bus or taxi could then take you to Bondi Beach or Coogee Beach (we prefer Coogee). Cronulla…the station is right beside the “village” – a wide/open pedestrian area (once a road but now closed off to traffic) and an easy 5-10 min walk to beautiful Cronulla beach. A lovely beachside walk there too and not as crowded as Bondi.